Ideal for separating and recycling waste materials. Lightweight, portable and can be folded for storage. Recycling in the workplace helps to make sure that businesses are helping to do their bit for the environment, and having the right receptacles will make that task even easier. Our multi-sack holders will help to make recycling straight forward. 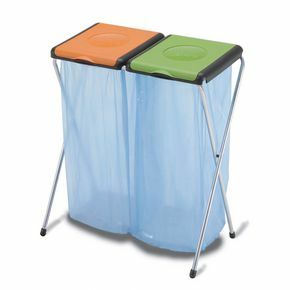 They are ideal for separating and recycling waste materials, thanks to the separate sack holding sections and colour coding lids. They are lightweight and portable, making them easy to move around from place to place and they can be folded for storage, so they could even be used for events. They are available as double or triple units to make segregating recycling waste simple for disposal. The units measure at a height of 820mm and a depth of 400mm. The triple unit has a width of 1055mm, while the double unit is 715mm wide. Our multi-sack holders are an ideal choice for separating and recycling waste materials. They come with a 12 month guarantee and are available for Next Day UK Delivery.